Can Pacific nations, endowed with islands of travel poster beauty, vibrant cultures, and centuries old ways of life based on sustainable practices, hurdle significant development and political challenges they face today  in addition to withstanding climate change and rising sea levels? Corruption, reliance on donor-driven aid and consultants, dwindling rural populations and burgeoning urban centers that stress the ability of governments to provide education and health services, an epidemic of non-communicable diseases as lifestyles change, and battles with countries outside the region for control of fisheries and deep sea resources  these are among the increasingly challenging issues facing the islands today. 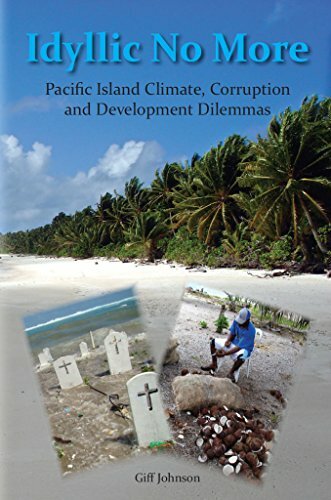 In a series of essays about the looming climate threat, sustainable development and the region's multi-billion dollar tuna industry, the U.S. nuclear test legacy in the Marshall Islands, and the impact of out-migration, 'Idyllic No More' addresses the often difficult problems and choices facing the Pacific islands today.The author, says veteran Oceania journalist Floyd K. Takeuchi, "frames a view of the Pacific islands that's characterized by hard-edge realism while offering a way forward. 'Idyllic No More' is a bracing look at where the islands are today, and what it will take to build a future of hope and opportunity for islanders across the region. "'Idyllic No More' is an excellent resource for stimulating discussion in classes, and for readers interested in contemporary Pacific island issues. Start reading Idyllic No More on your Kindle in under a minute. The author is the editor of the Marshall Islands Journal, the weekly newspaper published in Majuro, where he has lived since the 1980s. He is the author of Don't Ever Whisper: Darlene Keju - Pacific Health Pioneer, Champion for Nuclear Survivors (2013), and Nuclear Past, Unclear Future (2009). In this extraordinary little page-turner, author Giff Johnson draws upon experience gleaned from 40-some years of living and working in the Marshall Islands, where he has earned a reputation for outstanding integrity and well-balanced fairness. In the book, he addresses a broad range of issues with the clear insight of a true cultural insider. From corruption to under-performing government agencies, from human trafficking to the legacy of nuclear testing, the knowledge he brings to descriptions of chronic problems in the Marshalls are evidence of his deep personal familiarity with life in the Islands. Idyllic No Longer is an open gift to anyone who appreciates incisive analyses rendered with impressive candor and courage. I enjoy reading Giff's regular blogs on the Pacific Institute of Pacific Policy website. This book is a collection of those blogs, edited into a cohesive story about sustainable development, environment, health, corruption, fishing, government and other aspects of life. It's a great read for anyone looking to work in government or on policy in the Micronesia region, and even has parallels with islands further south. It's also a quick read, and each of the chapters stand on their own, so you can skip around and read up on the topics that interest you most. As a contractor who works in the Pacific, some of his criticisms really hit home as true. But so do some of his solutions. Johnson provides important insights into affairs throughout the micronesian states, and especially in the Marshall Islands. Yes, as sad as the truth may be, it needed someone to say it. Giff Johnson provides deep insight based on his many years of living, traveling and writing in the Marshall Islands and the Pacific. 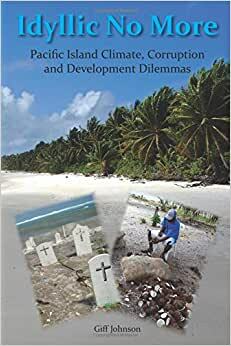 This book is made up of a series of short articles that examine the many challenges that RMI (Republic of Marshall Islands) and other Pacific island nations face. If you know nothing about Micronesia and small island Pacific states, you'll come away much richer for having read this. If you already know about this part of the world, you'll understand it much better. The first half of the book focuses on development and corruption issues and may be a bit more challenging to get through simply because it's heavy on the NGO/development matters. I found the later chapters to be more accessible when the author examines: maintaining sustainable fisheries, climate change, the unresolved impacts of nuclear testing, and outward migration. This is a must read book for anyone who seeks to understand Micronesia and the greater Pacific region. Definitely recommended.